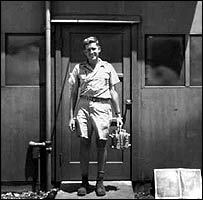 Harold Agnew was a nuclear physicist who helped develop both the first atomic bomb and the first hydrogen bomb. A lifelong nuclear hawk, Agnew was, according to the New York Times, "the last surviving major figure to have been present at the birth of the nuclear age." He passed away in 2013. As a young nuclear researcher, Agnew assisted the team of scientists that produced the first nuclear chain reaction in Chicago. He then moved to New Mexico to join the Manhattan Project, where he helped to develop a particle accelerator that was used in testing the effectiveness of various nuclear bomb designs. Embedding himself with the U.S. military, he boarded a U.S. bomber plane that accompanied the Enola Gay to measure shock waves from the nuclear blast that devastated Hiroshima and recorded the explosion on his personal camera. He was, according to his New York Times obituary, "the only person to witness the whole [atomic] undertaking, from reactor to weapon to Hiroshima." Agnew was unapologetic about his role in the atomic bombing of Japan, which killed and maimed hundreds of thousands of civilians. "My honest feeling at the time was that they deserved it," he told the BBC in 2005, "and as far as I am concerned that is still how I feel today." He added, "there are no innocent civilians in war, everyone is doing something, contributing to the war effort, building bombs. What we did saved a lot of lives in the long run and I am proud to have been part of it." After the war, Agnew returned to the Los Alamos National Laboratory, where he eventually rose to the post of director. Under Agnew's leadership, which lasted nearly a decade, the laboratory developed the world's first hydrogen bomb and vastly expanded the U.S. nuclear arsenal. "About three-quarters of the U.S. nuclear arsenal was designed under my tutelage at Los Alamos. That is my legacy," he later told the BBC. Agnew, who also served for six years as a Democratic state senator from Los Alamos during his tenure at the laboratory, left the institution in 1979 to become the CEO of General Atomics, a civilian nuclear energy firm based in San Diego. He remained at General Atomics until 1984. Agnew is a longtime proponent of controversial arms programs such as enhanced radiation weapons (also known as neutron bombs), as well as tactical nuclear weapons that could be deployed on the battlefield. In a 1977 article for the Bulletin of the Atomic Scientists, Agnew argued that the fusion reactions of neutron bombs could provide "tactical" advantages over conventional fission weapons, especially in countering the "massive armor component possessed by the Eastern bloc." Citing conclusions reached by the Rand Corporation, Agnew argued that without actually affecting the armor of a tank, the neutrons produced by a fusion blast would penetrate the vehicle and "in a matter of a few tens of minutes to hours kill or make the crew completely ineffective." Because the neutron bomb reduced collateral damage, Agnew said, it could be used in a much more selective fashion than a fission weapon, thereby providing a clear "advantage for the military defender as well as for the nearby non-combatant. … Even those who oppose nuclear weapons," he insisted, "would have had to concur in stating that it is better to have this type of tactical fusion nuclear weapon than the conventional pure fission bomb." Agnew served on numerous government advisory panels throughout his career, both during and after his tenure at Los Alamos. He advised the administrations of Presidents Johnson, Nixon, Ford, Carter, Reagan, and Bush, as well as the Department of Energy, NASA, NATO, and numerous congressional panels, among other bodies. An opponent of nuclear disarmament, he advised President Jimmy Carter against seeking a ban on nuclear testing and later advised the George H.W. Bush administration on securing the former Soviet Union's nuclear stockpiles at the end of Cold War. In the late 1990s, he was tapped to serve on the so-called Foster Panel, a congressional advisory body led by fellow nuclear veteran John Foster that played a key role in pushing for the development of new nuclear weapons during George W. Bush's first term as president. In the late 1990s, when a scandal broke out at Los Alamos over whether China had obtained classified computer codes related to the design of the W-88 nuclear warhead, Agnew took an indifferent position. In a letter to the editor of the Wall Street Journal, he argued that it didn't matter if China, already a nuclear power for three decades, had the design or not. "As long as any nation has a demonstrated nuclear capability and a means of delivering its bombs and warheads, it doesn't really matter whether the warheads are a little smaller or painted a color other than red, white, and blue," Agnew wrote. "I suspect information published in the open by the National Resources Defense Council has been as useful to other nations as any computer codes they may have received by illegal means." William J. Broad, "Harold M. Agnew, Physicist Present at Birth of the Nuclear Age, Dies at 92," New York Times, October 1, 2013, http://www.nytimes.com/2013/10/02/us/harold-m-agnew-physicist-present-at-birth-of-the-nuclear-age-dies-at-92.html?_r=0&pagewanted=all. 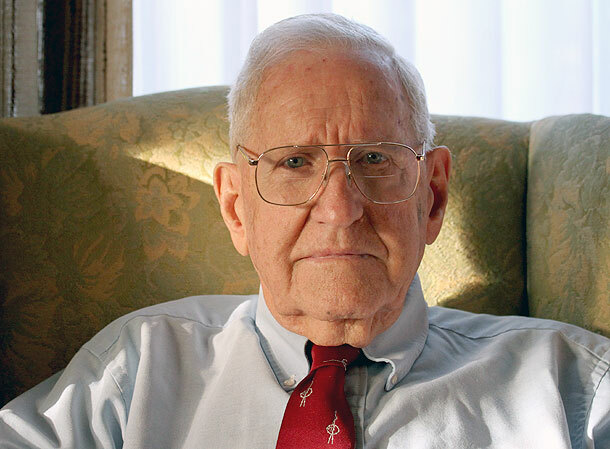 Tom Sharpe, "Former Los Alamos lab director Harold Agnew dies at 92," Santa Fe New Mexican, October 1, 2013, http://www.santafenewmexican.com/news/local_news/article_b9612ad1-27f8-5d07-9db3-6c84da4ff678.html. Matthew Davis, "The Men Who Bombed Hiroshima," BBC News, August 4, 2005, http://news.bbc.co.uk/2/hi/americas/4718579.stm. Harold Agnew, "A Primer on Enhanced Radiation Weapons," Bulletin of the Atomic Scientists, December 1977, pp. 6-8. Harold Agnew, "Looking for Spies in the Nuclear Kitchen," Wall Street Journal, May 17, 1999, p. A27, www.fas.org/irp/ops/ci/agnewwsj.html.